Advice from Rabbi Friedlander re forged mezuzos. I met today with Rabbi Friedlander in Yerushalayim. He is well aware of the forged mezuzah problem and suggests that the only 100% guaranteed way not to be duped is to ensure that you buy directly from sofrim you know and trust. He said there are enough sofrim out there that you can deal with them directly and don't need to risk buying from "unknown sofrim" through sochrim and wholesalers. However if one has no choice and needs to buy from a socher selling 3rd party items, he suggests that you ask the socher for the number of the sofer's teudah (kaballah). The socher has nothing to worry about because Mishmeres Stam will not give out names of sofrim. 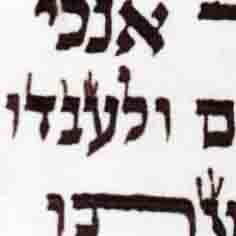 However Mishmeres Stam will have a copy of the sofer's writing on file. They will be able to tell you if the item you have matches their sample, thereby confirming the sofer is "real" and your product is legit. For those strict to buy only items written by sofrim with ksav kabbalah, this system should work well not only to weed out any of the forged mezuzos, but also to confirm that the sofer has kaballah. Just email Rabbi Granenstien the sofer's number and a scan of what you got and he will confirm by email that its all good. You only have to do it once per sofer. Rabbi Granenstien's email address is stam4@bezeqint.net. He happens to be an extremely nice fellow and always happy to assist. The numbering the teudah and scanning is this something they do just in Eretz Yisroel? 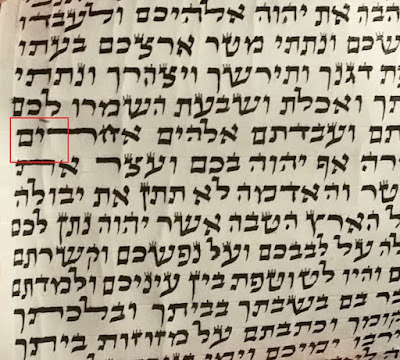 When I was farherred by the Vaad in Bnei Brak I brought along a yeriah I wrote but the rav there (forgot his name) told me I should have brought a copy and didn't scan the original so they don't have mine on file. 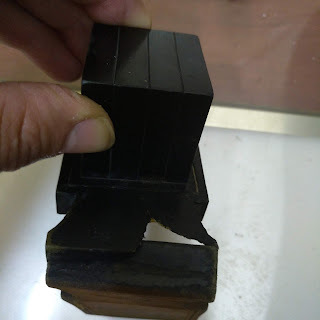 I'm sure I'm not the only one that happened to so if the Vaad doesn't have a particular sofer's sample, that does not necessarily mean the mezuzos were forged. A significant % of sofrim are certified by other organizations or by individual rabbanim so this etzah won't help for them. While it's certainly best to only purchase direct from sofrim (most of whom are in Israel) for a # of reasons this is not possible/practical for many of the sofrim. Most sofrim would rather sell to a local dealerand make a little less than to deal with overseas sources. The majority of sofrim depend on immediate, cash payment in order to survive. Even if the seller outside of Israel sends payment upon receipt, there can easily be a 2-4 week delay from completion of order until receipt of payment. If paid by check, who swallows the check cashing fee? (This is besides the present issue with cashing foreign checks.) What about the risks of doing business with someone out of reach, such as not getting paid for months, if at all and bounced checks? There's also the issue of the impracticality when the seller isn't satisfied with some of the merchandise. Therefore, many sofrim will only deal with someone local with whom they can expect cash in exchange for merchandise. On the flip side, many sellers are not in a position to make immediate payment so this precludes them from dealing directly with sofrim. For the few who can and can arrange for cash to be regularly available in Israel, they'd have to hire a local rep (or have a close friend or family member prepared to do a big chesed) so the sofrim can be paid upon local delivery of merchandise. Finally, in order to meet and find sofrim, sellers likely have to make occasional visits to Israel, which is a considerable expense. Baruch Hashem, there are a good number of ehrlich dealers in Israel. A reliable source can be identified by consulting with rabbanim such as Rav Friedlander or by asking for recommendations from long standing, erliche sellers outside of Israel. If you’re looking for sofrim who adhere to specific hiddurim/chumros/hakpados it isn't enough to find a reliable seller. The level of expertise in STaM varies even among the erliche dealers and many of them do not interest themselves in some/many of these particulars. While you could request certain hiddurim or ask if the sofer follows certain hiddurim, it would be in your best interest to find a seller who deals in this type of STaM. Expertise in batim and retzuos also varies among dealers and particular care must be taken if purchasing assembled tefillin. It’s imperative, to ensure the kashrus and standard of kashrus, that assembled tefillin are purchased from an expert, who reviews each pair and to verify that those who do the assembly are also experts as well as ehrlich bnai Torah. This is all assuming that the seller outside of Israel can find sofrim from a distance. As a seller in Israel myself, it's hard enough finding sofrim that I'm interested in working with so how much more so for those overseas.